Although I’ve had another month full of great reading experiences I can’t go past the first book I finished as my pick for the month. 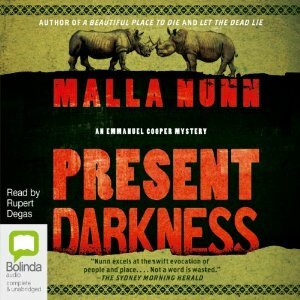 PRESENT DARKNESS is Malla Nunn’s best book to date (and I’ve loved its three predecessors). In 1950’s South Africa two black students are accused of the murder of a white couple and Nunn does a fantastic job of making the reader feel how skin colour impacts every aspect of life in this time and place. It’s a cracker of a story to boot. Although she died at the end of January I didn’t catch up with The Australian‘s obituary for Colleen McCullough until about a week later. Wish I’d never seen it at all. Although it does a decent job of describing her many achievements and successes it may as well not have bothered given its opening paragraph in which it is her looks (they use the phrase ‘plain of feature’) and weight that get top billing – and the fact that these attributes didn’t stop her attracting men! At first I was angry and scream-y and rant-y. Now I’m just sad. Why are we bothering with something like the Australian Women Writers Challenge when this country’s so-called national newspaper can write so degradingly about one of our best and most successful writers of either gender? It feels like a lost cause. The same paper’s obituary for another beloved Australian writer a couple of years earlier makes no mention of his looks or weight. But of course he was a he so those things don’t matter. I did most of my reading of Colleen McCullough before beginning this blog so she doesn’t feature here much but I did post something about my reasons for admiring her when she was included as one of six literary legends for an Australia Day stamp release in 2010. I’m doing well with most of these goals though my progress towards reducing my TBR slowed dramatically in February (only 1 of those 8 books was read during the month). I must do better on that front. But I’m quite pleased that I’ve already read 2 non-crime books (including a romance – which is almost as far from my comfort zone as it’s possible to go) and have another on order from the library. Even though I’ve completed my personal goal to read globally I’m going to keep counting. I’ve chosen Australian author Anne Buist’s debut novel MEDEA’S CURSE for my book club to read this month. The author is a perinatal psychiatrist of many years and has drawn on her experiences to write fiction about women who kill children. My library haul includes Eva Dolan’s LONG WAY HOME and Philippe Georget’s AUTUMN, ALL THE CATS RETURN and my ears will be enjoying Katherine Howell’s TELL THE TRUTH to start the month. I’m determined to pick a couple of books from my TBR mountain too. What about you? Did you have a favourite book for February? Have you got something special lined up for March? This entry was posted in Agnete Friis, Alan Hunter, books of the month, Cath Staincliffe, Ellery Adams, Elly Griffiths, Gabrielle Lord (Aus), K.T. Medina, Leighton Gage, Lene Kaaberbol, Lizzy Chandler, Malla Nunn (Aus), Robert Gott (Aus), Tracy Ryan. Bookmark the permalink. Bernadette – So glad this latest Malla Nunn lives up to her earlier work. I’m a fan, and it’s so nice when an author remains consistently appealing. As to the obituary? Please, oh please don’t get me started. Our newspapers are no better in that respect, many of them, and it’s just depressing. But I’m not giving up… Glad you’re making progress on your challenges. Of course you’re right Margot – we can’t give up. It is shocking that an obituary would show that bias. And it is depressing to know what women are up against in having careers and being recognized for their talents. Believe me things are better than they were when I was in my teens and twenties (or maybe the attitudes in California are that much better). But better is not good enough. I have not started reading Malla Nunn but she is on my list to read. My February reading was much slower than usual and I hope it (and my energy) picks up in March. Most of the time I think things are better for women too Tracy – my mum had to give up her job when she got married and that doesn’t happen today! But seeing that obit in such a prominent newspaper was really depressing and did make me question how much of the change has been at a surface level. I’ve had my own reading slumps in the past – hope your energy picks up again soon. Seems like a great month’s reading. Not too much in common – I have the Gage on Kindle and I was interested in Medina’s book at one time, but kind of not-too-fussed at the minute. I thought the Colleen McCullough obituary was quite a sad statement about the world we live in, that gender bias can still be so insidious. I have such fond memories of McCullough – I read The Thorn Birds as a school girl and while she went on to write many other books, that book was an iconic read for me and the memories of reading it will always stay with me. I’m hoping to get back to Norwegian by Night this month – I am about three chapters in and was really enjoying it, but I have it in ebook format and I’ve been making an effort to get more library books read, so I haven’t had a chance to come back to it until now. So glad to see you’re keeping up with your reading rate; it’s impressive. I wholeheartedly agree about Present Darkness and all of Malla Nunn’s books. her sense of place and time period is remarkable. think, gee, doesn’t she have a name? And so on. a terrific British blogger. Those are my priorities. writer, but I was so unnerved by Split Second that I will wait for a different book. Hope your March is as good as your February. Nice list with a few authors I’ve read and plenty more to try– and I agree that Present Darkness was very good! My favorite read of the month was Echoes from the Dead. And re: Colleen McCullough, the first paragraph is just seriously disrespectful. Somehow I think that female bestselling authors have it worse than female midlist authors, and I’m not sure why. Thanks for the reminder on Malla Nunn. I love her books.